It’s a question worth asking yourself, especially if you’re a leader. Recent research has revealed that the younger generation of workers wants to work at a company with high potential AND a high purpose. They want to make as much of a difference to profit margins as they do the marginalized. As a result, service—doing something for someone other than yourself or your people—is something many companies are beginning to explore, if not outright embrace. Members of The John Maxwell Company staff serve the North Gwinnett Co-Op. Here at the John Maxwell Company, we believe that serving is part of the requirement for leadership, and because we believe that, we’ve built service into our culture. 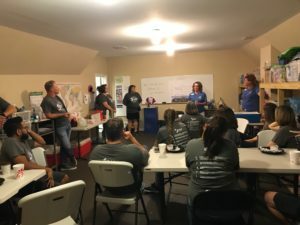 There are a lot of small ways that service shows up in our day-to-day work, but every once in a while, we call a time-out on the office life and we take our service into the community. The most recent example of this was on Friday, October 5, when our team spent an entire day volunteering at the North Gwinnett Co-Op, located just down the road from us in Buford, Georgia. 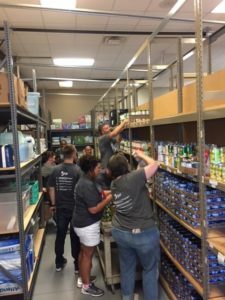 We had everyone from our CEO to our CSR on-hand to put a little sweat equity into a truly amazing organization. The Co-Op serves people in so many different ways—they give away bread from the local Publix bakery; the operate a Thrift Store where people can come and purchase everything from clothing to kitchen ware (they even had Halloween costumes on sale for only $4.00! ); they operate a food pantry that allows people to come and get staple items for their grocery lists at no cost to them. One of their biggest service programs is helping people have something for Christmas. Our team spent time helping people fill out their “Wish List”, which will be passed on to local shoppers that will go out and purchase items on the Co-Op’s behalf. Then, parents will be able to come in to the Co-Op on a special day and shop through those items for gifts to give their children. Co-Op Executive Director, Kim Phillips, address the JMC staff before work begins. And that’s exactly what the Co-Op does. Service is not just giving of yourself, it’s something you do for someone else to add value to them and help them embrace their full dignity as a person. Am I willing to serve someone today? Am I willing to add value to another person and help them in ways I may not even understand? If you decide that you are willing, I would love to hear your stories of service in the comments below because those stories are powerful reminders that, every day, we are surrounded by people who have intrinsic value and are looking for someone to simply recognize that value. To take a moment and care. I hope you choose to find just such a moment today. Indeed each time i get a Mail from John C Maxwell am always transform and Sharpen to impact and do more. May God bless and Keep protecting Him and John Team indeed a Great impact you all arw doing am blessed. Awesome message today John. This one has really hit home for me. I am in a service oriented job as a Head Custodian at a elementary school in Washington State and this has been a staple of my job. The joy you see when you take just a minute to show someone you care is amazing. Thanks again. I was walking out of Bible Study with my sister and a friend when I looked to my left and saw a man tucked behind some pillars laying on the ground. He had all his stuff around him so I figured he was sleeping. We walked to our car and as we were driving away it just niggled at me that there must be something I could do. We were approaching a McDonald’s so I asked my friends if we could go through the McDonald’s and get that man something to eat. We went back and sat down and talked with the man while he ate. I found out his name was Jeff and that he attended our church. He got a hot meal that night and I made a new friend. He is now off the street and working but we still say hi to one another and share advice and stuff. What a blessing to me it was to reach out and connect with this man in a personal way! I’m so glad we went back and gave Jeff a hot meal. I love the fact that you mentioned Corporate Social Responsibility CSR. I founded my HR consulting organization Human Capital Partnership Initiative (HCPI) in June of 2017 just a month after completing my Masters in HR Development at Villanova University. Heading into the Fall of 2017, I sought avenues in which to serve the surrounding communities and agreed to partner with Junior Achievement. In 2017, HCPI volunteered to facilitate Junior Achievement at three elementary schools in Columbus, OH. I enjoyed teaching the children on the subject matter of what it takes to be a successful entrepreneur. The children learned about entrepreneurs both far and nearby, they also learned about the three resources (natural, capital and human resources), supply and demand, and supply chain management. It was great to work with the children and see them learn and grow while also providing educators with a well-deserved extra breather. A friend asked me to google about John Maxwell, and I did, so awesome! In did it is inspiring, I really understand and add to my knowledge. Thanks to John Max.